Ben Carson Says No Apology Needed After Controversial Speech : It's All Politics Dr. Ben Carson, a well-known surgeon, made a splash last month when he criticized President Obama's policies in a speech at the National Prayer Breakfast. "It's a shame that we've reached a level in our country where we think that you don't have the right to put your opinion out there," he tells NPR. 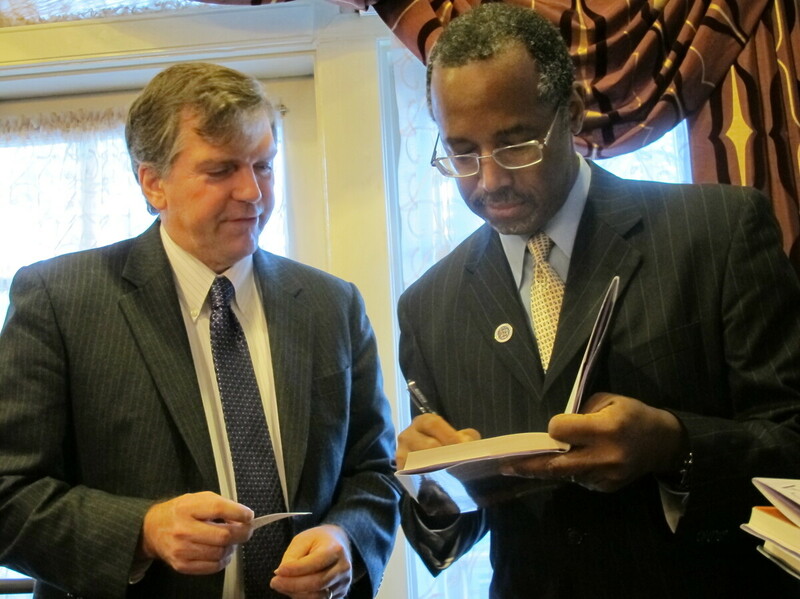 Dr. Ben Carson, right, signs a book for Delegate William Frank in Annapolis, Md., on Friday. Anyone still looking for Dr. Ben Carson to apologize for criticizing President Obama's policies to his face at the recent National Prayer Breakfast, won't hear one in his conversation with host Michel Martin's of NPR's Tell Me More. Carson, the famous Johns Hopkins pediatric neurosurgeon, made a large splash last month with a speech at the National Prayer Breakfast in which he criticized progressive taxation and President Obama's health care overhaul as the president sat just feet away. "I don't think so at all. In fact, I don't believe that expressing your opinion, regardless of who's there, is being rude. And it's a shame that we've reached a level in our country where we think that you don't have the right to put your opinion out there." That comment to Michel was consistent with what Carson said in The Speech that garnered so much attention, assuring he'll have an audience full of anticipation for his scheduled appearance at the Conservative Political Action Conference later this week. At the prayer breakfast, Carson chided many Americans for, as he saw it, a tendency towards supersensitivity, especially along lines of political correctness. To those who might be wondering why Carson's voice wasn't heard loudly during the height of the Obamacare debates in 2009 and 2010, Carson related two phone encounters he had at that time with White House staffers that clearly rubbed him wrong. One call ended abruptly, he said, after a White House aide asked him what he had done for the president during the 2008 campaign and Carson responded that he was a political independent. "The person was offended. I mean, how could you possibly be doing anything more important than talking to the White House? That was the end of that conversation. I talked to (Obama political consultant) David Axelrod ... about those two conversations and he said, 'Well, you know, we have some young people who perhaps don't exercise the best judgment and you shouldn't judge the whole administration on that basis.' And I take him at his word that you shouldn't. But it's not that I haven't made an attempt to influence the direction of things." Listen to the full interview on Tell Me More.